Launched by The Corps Network (TCN) in the spring of 2017 with support from the W.K. Kellogg Foundation, the Moving Forward Initiative seeks to expand career exposure and increase employment in conservation and resource management for youth and young adults of color. Through this effort, TCN will explore unconscious bias and structural racism within The Corps Network, our member Corps, and America’s land management agencies. TCN describes this work in racial equity as a journey. The start of this journey is the development of a foundation of knowledge on which to examine racism in the United States. TCN will provide tools and education to our staff, staff and young adults at our member Corps, and staff at America’s federal resource management agencies to make all parties better prepared to address bias and structural racism. 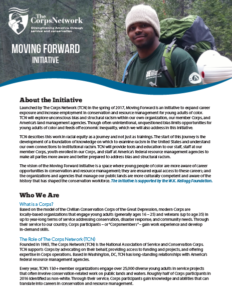 The vision of the Moving Forward Initiative is a space where young people of color are more aware of career opportunities in conservation and resource management; they are ensured equal access to these careers; and the agencies that manage our public lands are more culturally competent and aware of the history that has shaped the conservation workforce. Failure to address systems and knowledge deficits that limit opportunities for Corps alumni would be antithetical to TCN’s mission of helping Corps empower America’s young people. At the intersection of Corps, which train the next generation of conservation professionals, and the agencies that hire such professionals, TCN is uniquely positioned to – with the guidance of experts in racial equity – help make racial equity the standard in resource management. TCN recognizes the racial inequities at the origin of Corps. Created in 1933, during the time of Jim Crow, the Civilian Conservation Corps (CCC) discriminated against black enrollees. As TCN’s member Corps train diverse young adults for the resource management workforce, it is essential that we recognize past injustices and do our part to help create a conservation work environment in which diversity is celebrated.